A letter's signatures from the RG 224 collection, Nov. 16, 1887. 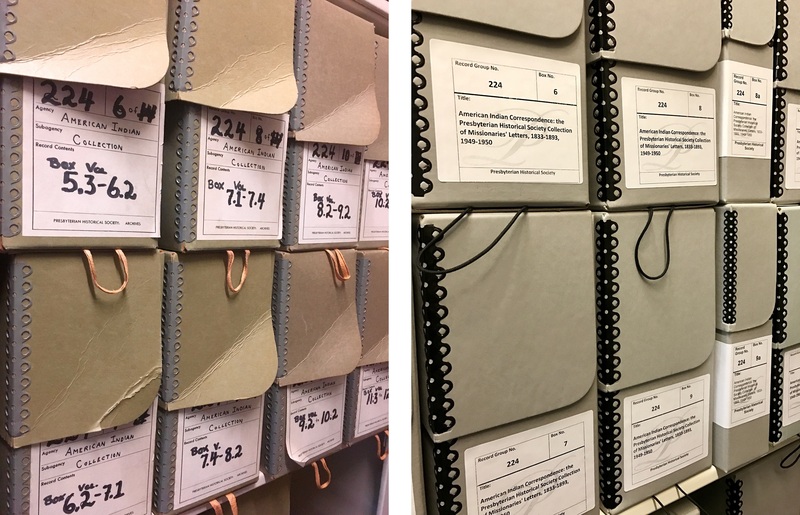 When I began working here in the spring of 2014, one of the first tasks assigned to me was aiding our Collections Management Archivist, Bill Brock, in cleaning up collection guides after their migration to the new PHS website. The process primarily involved reviewing the guides for presentation and accuracy of content. Some guides needed only simple editing while others required working with the collections. The most challenging guide thus far has been Record Group 224, Guide to the American Indian Correspondence: the Presbyterian Historical Society Collection of Missionaries' Letters, 1833-1893, 1949-1950. Over an eight month period in 2016, we worked to make the physical collection more accessible and the guide a better tool for staff and researchers to navigate the collection in its various formats. In the past, patrons had been encouraged to use the collection's microfilmed version which included its own guide. In 2016, a digital version became available online as a part of Gale Cengage's Archives Unbound collection. What started out as a review for clean up became a reprocessing project that involved multiple tasks including appraisal of some material, examining the papers for preservation concerns, rehousing the collection, working with the microfilm and digital versions and other related resources, and consultation with other staff members. It was during this extensive effort that we found a missionary tie to a sad point in American history. 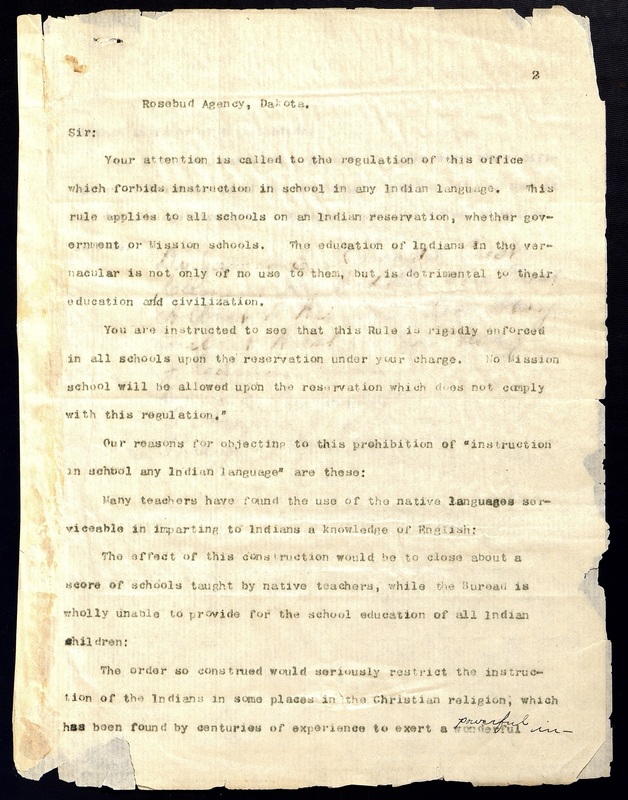 This restriction was in line with contemporary federal policy regarding Native American education following the model set by the Carlisle Indian Industrial School. This model aimed to “civilize” Native American people utilizing boarding schools that banned their languages, customs, religion, and other intrinsic parts of their identities. These schools, often run by missionaries, were the mechanisms by which children could be removed from their families and Europeanized. 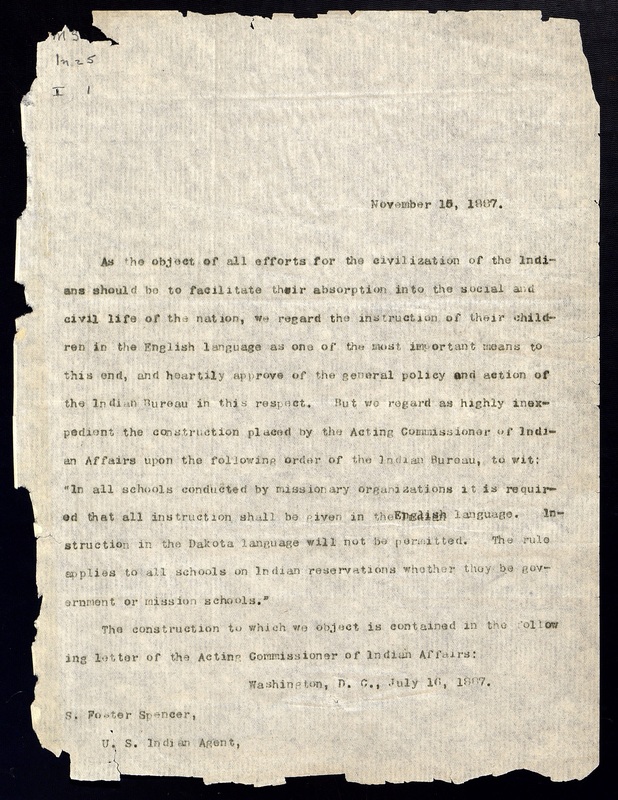 Missionaries in the Dakota Territory felt that requiring English and banning Native languages would hinder their ability to share the Gospel and generally educate students. J. Herbert Nelson, II, Stated Clerk of the PC(USA), and former Stated Clerk Gradye Parsons will next month travel to Barrow, Alaska, to deliver an apology on behalf of the Presbyterian Church to the Iñupiat people and other Native American groups affected by this kind of missionary participation in the historical suffering of Native Americans. The Stated Clerk and former Stated Clerk's travel stems from overture 11-08, submitted by the Presbytery of Baltimore at GA222; they will be hosted by the Presbytery of Yukon. The Presbyterian presence among Native Americans is particularly pronounced in our holdings. 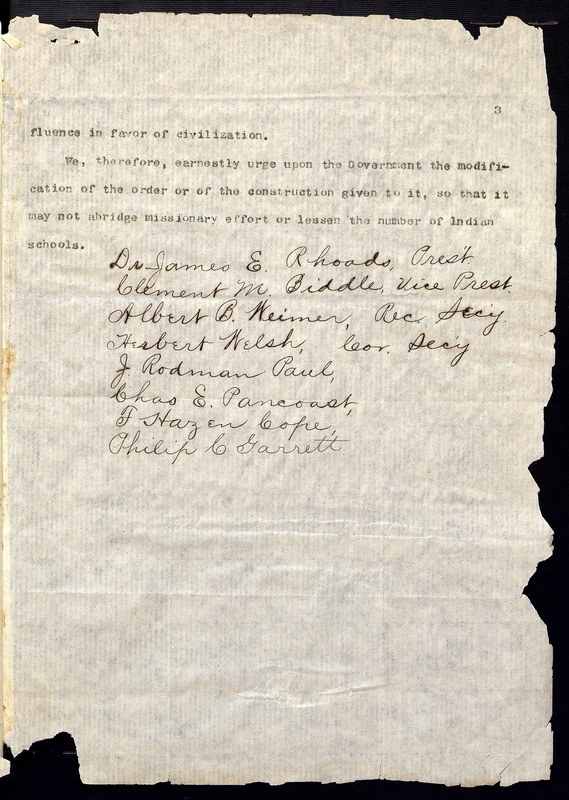 Collections like the Henry Harmon Spalding and Eliza Hart Spalding Papers, the W.R. Spurlock Papers, the Presbyterian Church in the U.S.A. Dakota Mission Collection and a plethora of administration records for Presbyterian/Presbyterian involved agencies like the Presbyterian Church in the U.S.A. Board of Foreign Missions are all housed at the Society. PHS endeavors to collect, preserve, and share the story of the American Presbyterian experience, whether good, bad, or ambiguous. The continued efforts to re-visit these collections helps ensure that we collect, preserve, and share all of the stories kept here.